Yet another post about aerotropolis developments, also referred to as 'airport cities'. These airport-centric developments are being planned and constructed worldwide. 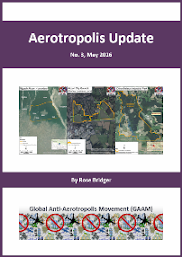 Here is the third issue of 'Aerotropolis Update', published by the Global Anti-Aerotropolis Movement (GAAM). The latest Update contains news of commercial and industrial development around 43 airports in 29 countries. Maps show the proposed land allocation for three projects: Nijgadh airport and aerotropolis in Nepal on an 80 square kilometre site, China-Belarus Industrial Park on a 95.5 square kilometre site adjoining Minsk Airport, and the 'Airport City Gatwick' business park on farmland to the north of one the UK's major airports. Allocation of large areas of land is a key concern because of displacement of rural communities and loss of productive agricultural land and wildlife habitats. 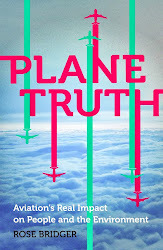 The Update contains information about resistance to two mega-airport projects: Ekiti airport in Nigeria, which was halted by landowners who, after bulldozers arrived and began clearing farmland without warning, filed a suit against land acquisition (see article in Ecologist - Nigerian farmers win High Court Victory in fight against Ekiti airport) and opposition to a second airport on the South Korean island of Jeju. 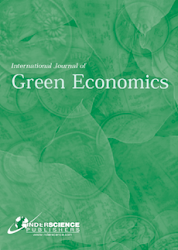 Proliferation of airports cities around the world raises also raises economic concerns - high levels of government expenditure, and overlap with special economic zones offering tax breaks and other incentives.